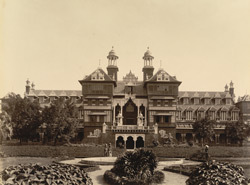 Photograph of the Baroda Museum, Gujarat from the Curzon Collection, taken by an unknown photographer in the 1890s. It shows the facade of the Museum which was designed by R.F. Chisholm and completed in 1894.